What Happens When Residential Road Closed? Have You Had To Deal With Road Closed? Who can enter a Road Closed sign to a residential area be cause the entire road is being resurfaced? Can School Bus, Public Transportation, U.P.S., FedEx, and other very large vehicles enter? Or is it limited to Residents and Emergency vehicles? Re: What Happens When Residential Road Closed? I would say no one. If you lived on the road, hopefully they have notified you when you can use the road. But otherwise, it's pretty clear road closed means road closed. I don’t think I’ve ever seen an outright “ROAD CLOSED” in this situation. It’s always paired with the “TO THRU TRAFFIC” qualifier whenever I see it. I've known streets to be completely closed, even to residents. Generally it's only a one-block stretch they're working on in that case, and residents must park on the street nearby instead. When the road in front of my house was rebuilt a few years ago, my access was generally unlimited as a local. It was a dirt/gravel road for a while. Every few weeks we wouldn't have any access. Had to park around the block on more than a few occasions. When I was a kid the local flood control district put a massive storm drain under my street; it started a block away from my home and continued down the alluvial all the way to the bottom of the hill (Glendale, CA). They marked it closed to through traffic, but maintained about a 8-9' easement down both sides so folks could get into their houses for the duration of the project (which took about 15 months, IIRC). When the excavation was completed, they completely rebuilt the street, including about the first 8-10 feet of everyone's driveway. Fortunately, quite a bit of the length was along the edge of a local cemetery, so they only had to contend with driveways along one side. Luckily for what there was of through traffic, there were plenty of parallel streets to take up the slack. This was in 1962-63; if such a project were proposed today in most jurisdictions there would undoubtedly be protestations and possible litigation by the local property owners -- even for a project that forestalled local flooding! Our street is closed every few years when the HOA has it sealcoated. Nobody’s allowed to drive on it, though some people always ignore the yellow tape and drive on it anyway. The maddening part to me is that a lot of our neighbors have no clue how to parallel park and leave way too much space between cars when we all need to park around the corner. I would assume if it's closed and you live down there AND the road is transversible that you want to would be asked to show identification. We deal with this occasionally with culvert replacements on dead-end roads. We provide notice to the public that the road will be closed to all through traffic, but our crews keep metal plates that they can put over the excavated portion if an emergency vehicle needs access. When we do full-width or monolithic resurfacing of narrow roads, we close the road to through traffic, but residents can get in and out via the end of the road that's not blocked by the paving equipment. I have been known to drive past barricades and to the actual point of the closure for clinching purposes. Had to do this on US 131 in Michigan when a bridge was being replaced, and on US 27 in Indiana where the entire roadbed was being dug up. I know someone who was billed by the HOA for driving on a road that was completely closed and damaging the seal coat. They'd been notified ahead of time that the road would be closed for most of a day. I've seen a couple of projects on significant roads take a ridiculously long time. The pavement was torn up quickly enough, then for months there was no change, and most days you don't even see anyone working. Then in one day they get half of the length half-way paved (leaving off about the top two inches of pavement), showing that they can get things done quickly when they decide to, and for months again there's no apparent work. On one of those roads, because it's near the only bridge over a creek in that area and the detour is through a severely broken grid, a lot of people have taken to driving around the barricades, which are marked to allow only residents. The road isn't in that bad a condition, and it's not like there's ever anyone there working. Even I do it, and I'm usually a stickler for the rules. I'll do it only during non-work hours and I go just far enough to get to the first road to the north, which is a much better detour for me than the official one on the south side, which requires 4 stops and 7 turns (to get around less than three quarters of a mile of road). The other case of taking far too long was on a piece of road with much better detours. They originally tried keeping it open during non-work hours, but it was in horrendous condition because of frequent rain, so it had to be completely closed, even to residents. Those barricades were curb-to-curb, and no one went past them. I would assume the police department isn't going to set up and staff a checkpoint for the duration of a local street reconstruction project. 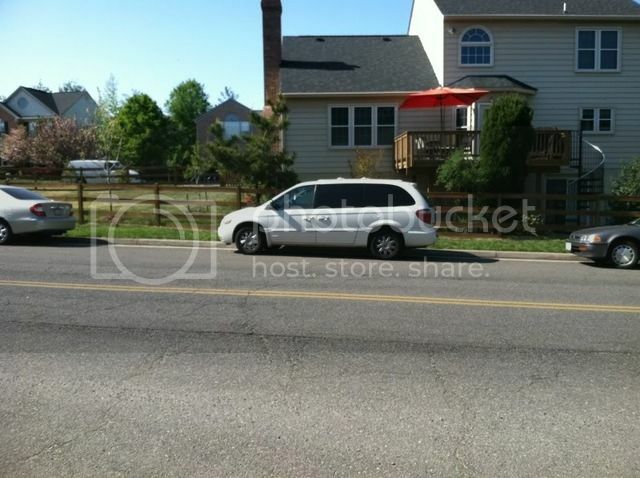 I park my car on a nearby street away from the neighbors driveway and walk to my house from there. That's when the sewer line, gas lines and plumbing to the house under the street were being changed. I had to park somewhere else until the construction was over. The street shown here is a VDOT street, whereas we live around the corner on an HOA street, hence the different maintenance schedules. 2. If they have to resurface the roads every 3 years (mill and pave) they are doing something very wrong. A proper pave of a light traffic street should last at least 10-15 years, even in the snowbelt. They don't do a full milling and paving. I think they call it "sealcoating," though I'm not sure—the contractor comes out and does something and when they're done the street is a nice fresh black color with any cracks and other such stuff filled in. Either way, they tell us in advance and for two days we have to park around the corner. I actually encountered a long closed street recently. In this case they worked on half of the street and half the street was closed off. Construction workers led motorcades and every body got to drive on the wrong side of the road.